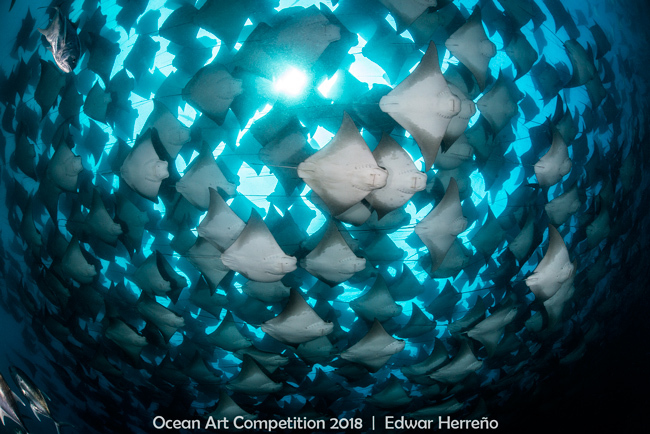 The Story: From August to November, golden rays migrate in large numbers in Costa Rican Pacific waters. No one knows the exact reason, but it can be to protection from predators or as a social/mating behavior. I was looking for this picture for years and after several weeks searching and working with biologist specialised in rays, I spotted a good place using my drone. I did several dives in this area and waited patiently, then When they came on top of me, I was shock and forgot that I had a camera in my hands. Any effort I did for this encounter, word it! Simply magic moment. Equipment Used: Nikon D800 Camera, Hugyfot Housing, Sigma 15mm Fisheye Lens, Sea & Sea YS-250 Pro Strobes.